Like the design? Buy it in t-shirt form! Digital Rights Mangling, er Management. There isn't much point to this post other than me going on about something I don't like. There's an article Cory Doctorow wrote that does a far better job than I ever will at going into detail why DRM is, instead of killing copying, a tool to kill innovation and competition. However the basics are this: Look at the CD. Look at the DVD. We have things like iTunes, iPods, etc etc because the fact CDs aren't bundled with some kind of patented protection method that some clever software that makes a thing to rip the easy-to-copy bits out of won't get sued for the new use of product. DVDs on the other hand with their DRM and Region Locking will never offer any such function and so you don't get inventive uses the original designers never thought of because bright bulbs get sued into oblivion. Oh and Walmart's 'bring your DVD in and we'll give you a digital copy? Nope. That's actually them reading what the disc is and spitting out an archived digital copy. I like the idea but still that's Walmart leveraging how taffing huge they are to make things happen. Joe Smillington wouldn't be able to do that since the nanosecond he tried he'd get slapped with all sort s of lawsuits and damned if he's actually legally in the right. You can't fight someone that can win in a battle of attrition and all they need to do is make you say you give up and pay them damages plus your legal fees. Principles be damned. When taking a stand means becoming a debt slave most people won't bother. Especially when copying bits always gets easier at the personal level. Come to think of it DRM isn't ever about what little Joe and Jane Pirate are up to. It's about ensuring you don't get new business competition, or if you do they're paying you royalties and licensing fees for that little patented and trademarked widget and are playing by the rules you sat down when the new technology came out. I'm sure this surprises absolutely nobody. Since everyone knows there's a problem, and the 'right' way to solve it is sealed shut since the game itself is rigged by greedy people with more money than humanity. What do you do? I've got no 'Big' answers other than try to fix the system so it's less broken by calling Representative get involved in politics. Yes yes the cynical voice goes on at how useless this is, and while i happen to agree that it's an impossible task it is still something worth attempting on the off chance I'm wrong. Because I want to leave you with something of educational value. 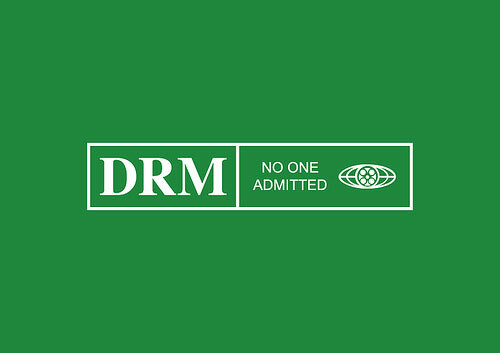 Here's LGR going into a little bit about the history of DRM in gaming. Keep in mind it came out before Sim City did and LGR was right in the 'Needs to be Online' DRM was one of the biggest problems with the game.